Share the post "Common Vervain – Verbena Officinalis Or A Holy Herb"
Verbena officinalis, the common vervain or common verbena, is a perennial herb native to Europe and is naturalized in Australia, North America, and many other places in the world. Vervain is best gathered in summer. It grows up to a metre (yard) high, with an upright habitus. The lobed leaves are toothed, the delicate spikes hold mauve flowers. This plant prefers limey soils; occasionally it is grown as an ornamental plant but more often for the powerful properties some herbalists ascribe to it. OTHER NAMES: Verbena, Verbenaca, Veneris Herba, Herba Sacra, Holy Wort, Druid’s Weed, Brittanica, Pigeon’s Grass, Blue Vervain, Eisenkraut, Enchanter’s Plant, European Vervain, Herb of Grace, Herb of the Cross, Herba Verbenae, Herbe aux Enchantements, Herbe du Foie, Herbe Sacrée, Herbe aux Sorciers, Herbe à Tous les Maux, Herbe du Sang, Herbe de Vénus, Holywort, Juno’s Tears, Ma Bian Cao, Pigeon’s Grass, Pigeonweed, Simpler’s Joy, Turkey Grass, Veine de Vénus, Verbenae Herba, Vervain, Verveine, Verveine Commune, Verveine des Champs, Verveine Officinale, Yerba de Santa Ana. It is also known as a Holy Herb, or more ambiguously as “Mosquito Plant” or “Wild Hyssop”. The common name “blue vervain” is also sometimes used, but also refers to V. hastata. And of course, being the only member of its genus in much of its range, it is also simply known as “the vervain” locally. Verbena has long been associated with divine and other supernatural forces. It was called “tears of Isis” in ancient Egypt, and later on “Juno’s tears”. In ancient Greece it was dedicated to Eos Erigineia. In the early Christian era, folk legend stated that Verbena officinalis was used to staunch Jesus’ wounds after his removal from the cross. It was consequently called “holy herb” or (e.g. in Wales) “Devil’s bane”. The scientific name references the Ancient Roman term verbena, used for any sacrificial herb considered very powerful. Officinalis, meanwhile, is Latin for “used in medicine or herbalism. Ancient Roman priests swept and purified the altars of Jupiter with bundles of vervain. They also used it ritually to create love and peace. Ancient Germans wore vervain on their bodies as charm to create peace, bring love, and pacify evil energies. Verbena officinalis herb has been used in the traditional Austrian medicine internally (as tea or liqueur) for treatment of infections and fever. 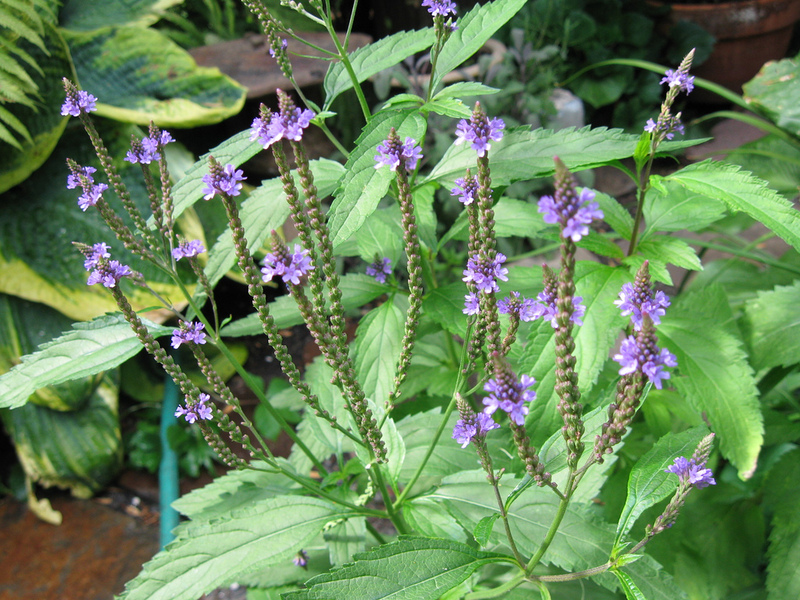 Common Vervain is usually used as a herbal tea “Vervain”. Verbena has been listed as one of the 38 plants used to prepare Bach flower remedies, prescribed against “over-enthusiasm”. In the Modern Era, it is sometimes considered a powerful “ally” of poets and writers, as its relaxing effects can relieve writer’s block. The essential oil of various species – mainly common vervain – is traded as Spanish verbena oil. – Vervain is used as antibacterial, analgesic, anti-inflammatory, and blood coagulant. – It also is thought to have anti-tumor activity. – The herb is considered to be an anti-depressant and has a powerful calming effect. It is useful in cases of insomnia for creating restful sleep. Vervain is also very good for calming anxieties, and has a very balancing effect on the hormone cycles of women. – Vervain is very helpful in treating headaches and gallstones, and acts as a tonic for the liver and heart. – The flower tops are prepared as a tea or tincture to treat insomnia and cramps. – A wash of vervain is excellent for mouth ulcers, hair and eyes. – A poultice of the herbage may be used to rapidly heal wounds. Vervain herbage, either fresh or dried, can be placed in boiling water and steeped to make a tea. A word of cauton: Vervain does cause nausea in some people, and must be avoided by pregnant and breast-feeding women. Tips: Well suited to growing in a mixed herbaceous border and beneath trees and shrubs. Plant 7cm (3in) deep in well-drained soil. Onions are drought tolerant when they are established. Decrease water when the flower appears. Do you grow Verbena Officinalis in your garden? What is your experience with this plant? Please share in the comments below! Do you sell Verbena Officinalis seeds or have plants for sale? You can place your advertisement here. Contact us now! I just love Vervain tea. It tastes so yummy!